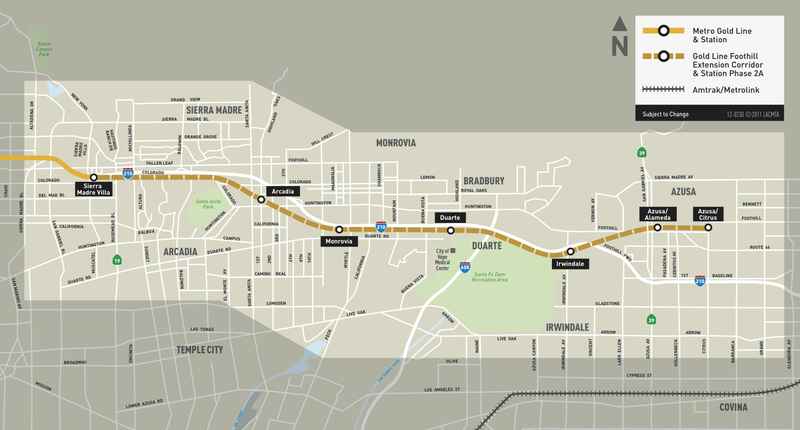 Seven minutes of awesomeness from our friends at the Gold Line Foothill Extension Construction Authority, the agency building the 11.5-mile project between eastern Pasadena and the Azusa/Glendora border. Sign up for e-updates from the Construction Authority here. Lots of bridges! Can’t wait! Are the grade crossings really being built without arms and RR-crossing signals? Is it on schedule? I was thinking it would be open in 2015? @Erik Griswold Well, they aren’t finished yet… They still have much more stuff to install so most likely they’ll be adding the RR-crossing signals and arms last… right before they begin testing out the line..
At this time, I believe the current Metro forecast is for the line to open in early 2016. Of course, that will depend on a lot of things — progress of work, weather, funding, etc.